Liven up your room with this stylish and unique framed artwork printed on museum-quality paper using high-quality inks. 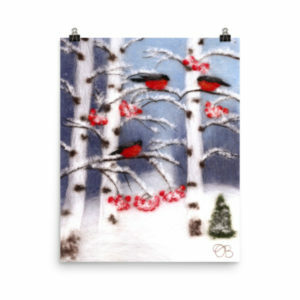 The print of my original wool painting “Bullfinches in a birch grove” showcases the image of a winter forest landscape with a trio of bullfinches perching on the snowy branches of an ash tree. This print is sure add an artistic touch to your walls and catch the eyes of your guests. Print is available in a variety of sizes.